A while back, Shocka asked why Transformers is the only property with any kind of substantial "third party" presence. We didn't come up with any good answers, but then here come the Articulated Icons, with their Hand Ninja and their Ogun and their Silver Samurai. Timeless and unblinking, the Temple Guardians of the Shogunate maintain a selfless vigil against the extraordinary manifestations of evil that plague the feudal landscape. Through countless hours of training and meditation, through hardships that temper the body and steel the mind, the Temple Guardians are forged into perfect warriors. Utilizing ancient, secret methods, the Guardians are taught to see that which lies beyond ordinary human perception. For each generation, only a handful of devoted warriors are able to withstand the terrors that pass unseen by mortal eyes: the gokai, the oni, the obake and countless others. With the rise of the Ninja threat, the Temple Guardians have become the last line of defense between the Shogunate and these near-supernatural foes. Relinquishing all notions of self, nameless and faceless, poised on the precipice between the physical and the metaphysical, the Temple Guardians straddle a narrow line that few could walk. With each day they must be vigilant that they do not become that which they guard against. 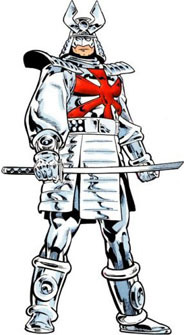 This may "not" be the Silver Samurai, wink-wink, but it's a samurai and it's silver; no one was going to release this without knowing how it would be interpreted. 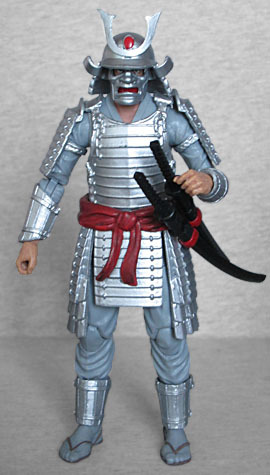 There were, at one point, tentative plans to make a Marvel Legends Silver Samurai, but that was a decade ago and Hasbro still hasn't made one, so we'll take what we can get. All the armor bulks up the body just enough to make the head look comically small on the body - at least, when his mask and helmet are off. The Guardian is bald, with the removable topknot the Deluxe Ninja had. 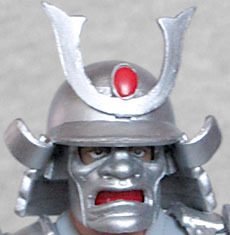 His lower face is concealed by a red bandana which, combined with the bald head, seems him feel similar to the 2007 Cobra Troopers. The eyes are painted slightly crooked, but it's easy to look past. Since all the armor is done as separate pieces, the Temple Guardian's only accessories are a katana, wakizashi, and the scabbards to store them in. The belt loop plugs into the left side of his waist, so he can reach them to draw them easily. The armor doesn't impede the articulation too badly: the figure has a balljointed head, hinged neck, swivel/hinged shoulders, swivel biceps, double-hinged elbows, swivel/hinged wrists, balljointed hands, a swivel/hinge torso, swivel waist, balljointed hips, swivel thighs, double-hinged knees, swivel shins, and swivel/hinge ankles, and really only the chest joint gets blocked at all - partially because the paint had gotten stuck to the body. 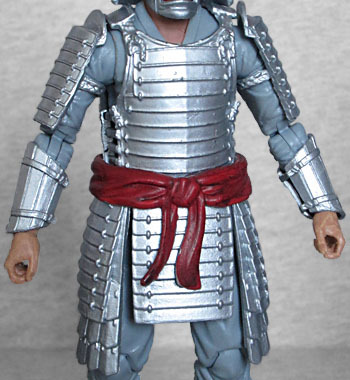 Behind the shin guards, the Temple Guardian must have new lower legs, because while the ninjas were reliably 6", this toy is not; out of his helmet, he's about ⅛" shorter than that. So if you want to use him as a stand-in for the non-existant Marvel Legends Kenuichio Harada, he's going to be a little undersized. Which might work, considering how short Wolverine is, but it's still too small to be perfect. 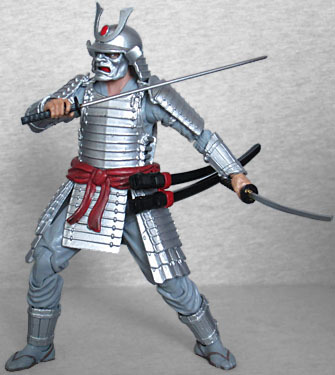 Of course, there are other things keeping this silver samurai just on the defensible side of legal, as well; but until such time as Hasbro decides to make one themselves, this is a fine third party replacement.